The Nats offense has mostly been MIA for the month of May. Last night’s (May 28) gift to the Marlins in 10 innings was especially ugly (and typical of this whole month). They loaded the bases with no outs in the 8th inning and failed to push even one run across the plate with the game tied at 4. I can remember 4-5 other times this year when that happened. Then in the bottom of the 9th, the leadoff batter, Wilson Ramos, was thrown out at second trying to stretch a single. He would have scored the winning run if he had played it safe, as Frandsen and McLouth both got base hits after that. Then in the 10th inning the Marlins rallied to win the game. The Nats batting average for May is the worst in the major leagues. They have a bushel basket of losses by one or two runs. Clutch hitting with runners on base is exceedingly rare. OK, Ramos, LaRoche, Zimmerman and Harper (four of their bast hitters) have been out with injuries. The way Ramos was tearing up spring-training pitching, it appeared he would come out of the gate on opening day leading the offense. But he went on the DL after the very first game and though he’s back in the lineup now, he has yet to regain his hot bat. And the best one can say about the bench hitting is that it is better than last year’s. LaRoche is the only starter who has steadily maintained an average over .300. Rendon and Espinosa both started very hot in April, but Danny is now reminding us of 2013 when he couldn’t even hit at Syracuse! Rendon is in the first slump of his pro career and one can only hope he turns it around soon. His approach appears to be the same as always, a good sign. And that makes me think his numbers will begin to improve. When they score 4 or more runs the Nats win 90% of the time, so that is a good goal to shoot for. Ian is one of the strongest leaders on the team, and now he has apparently taken on the challenge of giving up chewing tobacco. He stopped “dipping” during the Christmas holiday season and says he got through Spring Training without a hitch. Smoking, chewing and dipping are all habit forming (and are popular with athletes) and have all been linked to cancer, gum problems and tooth loss. Ian’s mother is still a huge influence and she has been encouraging him in this effort. He is well aware also that he is a role model for the younger generation. Desmond has always been one of the most inspirational players on the Nats roster. He spent years in the minors working hard to reach “The Show.” I still remember seeing him playing for the Potomac Nats and during Spring Training in Florida (2005 or 2006). This season has been a struggle for the whole team, including Ian. His hitting and fielding are both below what we know he’s capable of, though he is the team leader in runs-batted-in at this point. He is still excelling in a couple of areas however; he and Danny Espinosa together have more home-runs than any other middle-infielder combination in the major leagues! And as usual Desmond is a superb team leader. In every game we see him talking to his teammates (especially the younger pitchers like Treinen and Barrett) calming them and keeping them focussed on the essential task at hand. Stras pitched very well yesterday, lowering his era to 3.42. Though he gave up 2 runs in the first inning, he shut down the Dodgers after that into the 8th inning. meanwhile his teammates, including Wilson Ramos—back from the DL, took a lead they would not relinquish. Grinding through adversity has not been his strong suit, but Stras is improving on that. Tom Boswell has a great article (again) in today’s Post on this. He compares Stras with Clayton Kershaw. Meanwhile, the guy who played 2B for the Orioles yesterday has a batting average 70 points below that of Steve Lombardozzi, and it is Lombo who has been sent down to AAA! Go figure. NL East is tightest division in baseball! Check out the Richard Justice article on MLB.com. It’s a good read! 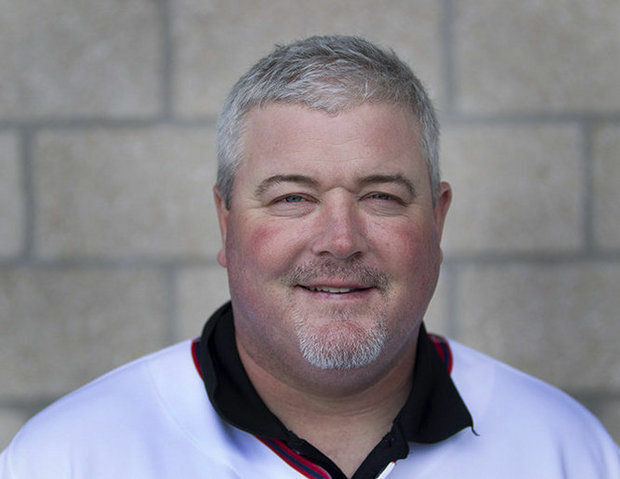 Matt Lecroy is the new bullpen coach of the Nats, having been hired over the winter by new manager Matt Williams. Several weeks ago a TV videoclip of Lecroy dashing in from the bullpen went viral, as a little “dustup” evolved into a possible bench-clearing brawl during a Nats game. The video looked like a Marx Brothers “Chinese fire-drill” with Lecroy at first leading the charge, then slowly fading as the 20-something pitchers quickly left him in their dust:) He subsequently fell down (tripped over himself?) and never arrived at the two-team face-off in the infield (no punches were thrown and things simmered down quickly). The fact that the middle-aged Lecroy is more than several pounds over-weight added to the comical video! Fast-forward to Friday night’s game (May 2) and another bench-clearing face-off between the Nats and Phillies. The bullpen gates open and out charges Lecroy, followed by the much younger pen denizens (you just can’t make this stuff up!) again. Again no punches were thrown and in the post-games press conferences the protagonists (Cliff Lee and Denard Spann) both claimed through clenched teeth and straight faces that they were not angry with each other:) Stay with me here…………..
A footnote in today’s Washington Post has a story about the one injury from Friday night’s potential armageddon; Matt Lecroy is now laid up with a pulled muscle in one leg:) Me thinks the team might want to put the new bullpen coach on a leash? I’ve mentioned this before, but we continue to see how Stephen Strasburg can become rattled and loose his focus when events occur during games (errors by his teammates for example, or a plate umpire with a strike zone not to Stephen’s liking). Last night in the 3rd inning Jason Werth dropped a routine fly ball in foul territory that would have been the third out. Right after that Stephen threw a fastball right across the middle of home plate to a good hitter, Marlon Byrd, who hit it for a 3-run homer. Those were the only runs Strasburg gave up in his 6 or 7 inning stint, so he was able to settle himself down after the home run. My point is these episodes seem to affect Stephen’s pitching more than they do most pitchers. I’m sure the Nats coachs are trying to work with him to increase his ability to stay focused on “grinding” through opposing team’s lineups while tuning out adverse events that are not under Stephen’s control. 1. Former Nat (a very popular one!) Mikey Morse (“The Beast”) hit the game winning home run as the Giants beat our nemesis, the Atlanta Braves. That was the Braves 4th straight loss! 2. Another former Nat, Steve Lombardozzi, hitting .292 for the Orioles was sent down to AAA in order to make room for star third baseman Manny Machado as he came back from injury to play yesterday for the first time in 2014. There were other Orioles that in my opinion should have been sent down instead of Lombo. Note to Mike Rizzo: Get Lombo BACK! 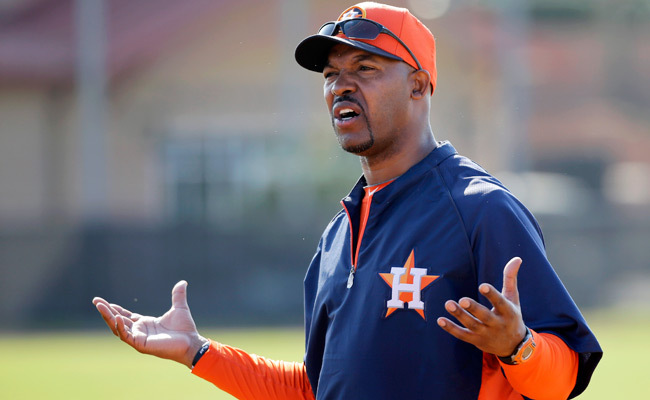 Bo (formerly with the Nats coaching staff) has his hands full in Houston, with a roster mostly filled with very young players who would be playing in the minor leagues of most other clubs in the majors. After watching the 2 recent Nats games in Houston, I’m very impressed with Porter’s creativity and willingness to try new ideas. I’ve noticed a “minor buzz” around National League coaching staffs that some of Bo’s new approaches are attracting favorable comments among his peers.